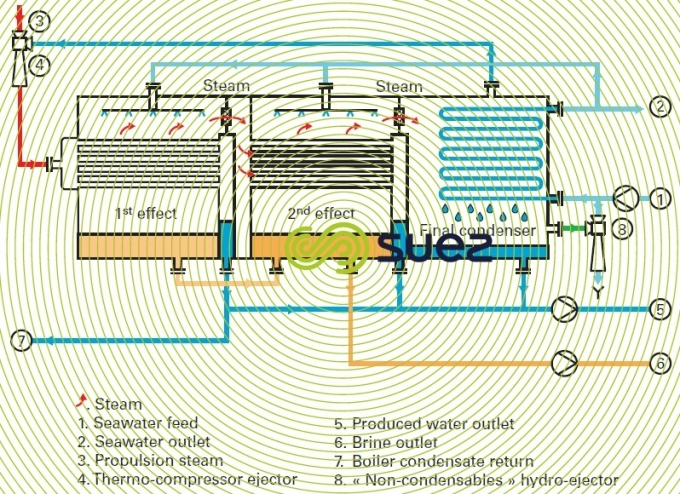 In order to further increase the global output ratio (GOR), thermocompression is feasible where a proportion of the steam from the final effect is mixed with the propulsion steam using a thermocompressor (the propulsion pressure has to be higher than 3b abs). The mixture made up of low pressure steam and "live" vapour will provide more steam that "live" steam on its own at intermediate pressure and temperature levels. This system allows GORs to be increased almost two-fold. Over recent years, this technology has gradually supplanted the MSF technology, thus reducing both investment costs and the cost of the water produced. Specific consumption with this type of unit can fall below 70 kcal·kg–1 of water produced and the temperature differential between effects can vary between 4 and 10 °C. This technology is used to construct installations each having a capacity of up to 22,000 m3 per day.